Germina center in lymph node. 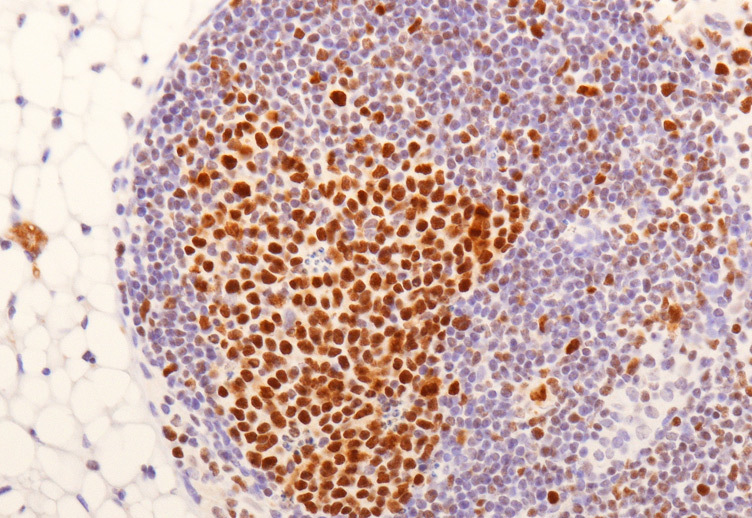 Germinal center B cells are identified on the basis of Ezh2 expression (brown). Our ability to produce antibodies with high specificity for foreign substances (antigens) is dependent on Germinal Centers (GC), a highly specialized structure that forms in response to certain antigens in lymphoid organs, including tonsils and lymphnodes. GC are generated when B lymphocytes (also called B cells), the cells that will eventually produce antibodies, encounter for the first time an antigen for which they have some, usually low, degree of affinity. Once recruited to the GC, B cells rapidly proliferate in the so-called dark zone and, notably, actively modify their DNA, specifically the Variable (antigen encountering) region of their antibody genes by the process of somatic hypermutation (SHM). Protection against deadly pathogens requires the production of high-affinity antibodies by B cells, which are generated in germinal centers (GCs). Alteration of the GC developmental program is common in many B cell malignancies. Identification of regulators of the GC response is crucial to develop targeted therapies for GC B cell dysfunctions, including lymphomas. The histone H3 lysine 27 methyltransferase enhancer of zeste homolog 2 (EZH2) is highly expressed in GC B cells and is often constitutively activated in GC-derived non-Hodgkin lymphomas (NHLs). The function of EZH2 in GC B cells remains largely unknown. Herein, we show that Ezh2 inactivation in mouse GC B cells caused profound impairment of GC responses, memory B cell formation, and humoral immunity. EZH2 protected GC B cells against activation-induced cytidine deaminase (AID) mutagenesis, facilitated cell cycle progression, and silenced plasma cell determinant and tumor suppressor B-lymphocyte-induced maturation protein 1 (BLIMP1). EZH2 inhibition in NHL cells induced BLIMP1, which impaired tumor growth. In conclusion, EZH2 sustains AID function and prevents terminal differentiation of GC B cells, which allows antibody diversification and affinity maturation. Dysregulation of the GC reaction by constitutively active EZH2 facilitates lymphomagenesis and identifies EZH2 as a possible therapeutic target in NHL and other GC-derived B cell diseases. As a consequence of these DNA modifications, the original specificity of the antibody for the challenging antigen will either be lost or greatly increased in different B cells within the GC. B cells will then move to the Light Zone of the GC, where they encounter the antigen again: cells carrying on their cell surface an antibody with high-affinity for the antigen will be selected for survival and differentiation into memory cells and plasma cells, the final producers of high affinity antibodies; B cells carrying antibodies that have lost affinity will miss the encounter with the antigen and die. In the GC, B cells also undergo a second DNA modification in their antibody genes, namely class-switch recombination (CSR), a DNA remodeling event that confers distinct biological properties to antibodies with identical specificities. SHM and CSR represent highly-specialized functions unique to B cells; they are both performed by an enzyme, activation-induced cytidine deaminase (AID), whose function involves the creation of DNA breaks, an event that is normally not tolerated in other cell types. The ability of GC B cells to control proliferation and differentiation while performing sophisticated genomic remodeling functions is critical to ensure the selection of antibody-producing cells as well as the elimination of dangerous cells producing antibodies against self components or carrying excessive DNA damage and mutations that may lead to cancer. Thus, a thorough understanding of the mechanisms regulating the GC is important for the understanding of the physiology of antibody production as well as of the mechanisms that lead to pathology, including autoimmune diseases and lymphomas deriving from the malignant transformation of GC B cells. Toward this end, important insights into GC physiology and pathology have been provided by the study of Caganova et al. in the research teamled by Stefano Casola at IFOM (Caganova et al. J. Clinical Investigation, 123: 5009-5022, 2013). Their research has focused on the function of EZH2, a gene encoding an enzyme (methyltransferase) that contributes to the regulation of specific target genes by posing repressive markers on chromatin, the protein structure that coats DNA and regulates its activity. Casola and colleagues have selected to study EZH2 based on two important observations: first, the EZH2 gene is expressed at high levels in GC B cells, suggesting an important and specific function; second, its structure and function is altered in various types of lymphomas, suggesting a role of these alterations in tumor development. In order to identify the normal function of EZH2 in the GC, Casola and colleagues generated mice in which this gene was specifically deleted in GC B cells. These mice displayed specific defects in the formation of GC and in the generation of memory B cells, leading to greatly impaired antibody-dependent immunological responses. In a series of remarkably precise and sophisticated investigations, they also showed that the function of EZH2 in GC control is based on multiple mechanisms, among which two appear particularly relevant: first, EZH2 protects the genome of B cells from the excessive genomic damage produced by the remodeling functions of AID, thus preventing or repairing genetic lesions that are dangerous for malignant transformation. Second EZH2 represses the expression of BLIMP1, a gene required for the differentiation of B cells in memory and antibody-secreting plasma cells, thus preventing the premature exit of B cells from the GC prior to their selection for the production of high-affinity antibodies. These results identify EZH2 as one of the most important regulators of GC development and therefore of the development of physiologic antibody-mediated responses to foreign antigens. The results of the Casola&apos;s group have also important implications for the pathogenesis and the therapeutic treatment of lymphomas. Both Follicular Lymphoma and Diffuse Large B-Cell Lymphoma, the two most common types of human lymphomas, express the EZH2 gene and protein, and a fraction of them carry a mutant form of the EZH2 gene that alters its activity. As suggested by the authors, the roles of EZH2 in protecting from AID-induced DNA damage and in preventing differentiation imply that genotoxic drugs, in combination with differentiation-inducing agents, may be useful complements in anti-lymphoma regimens. More importantly, drugs specifically targeting and inactivating normal or mutant EZH2 are already available and have been shown to have activity against lymphoma cells. The results of the Casola&apos;s group provide important insights into their mechanism of action and identify potential biomarkers to monitor their activity.